Salesforce is one of the most versatile, customizable tools in your company’s arsenal. But with all that customizability, it’s also a breeding ground for error-filled, messy data. Poor data quality—or dirty data —is a universal problem, and IBM estimates that it costs the US $1.3 trillion per year. However, there are some best practices you can follow that will allow you to get accuracy on the pieces of data that are most important to your company and have long-term Salesforce success. If you’re managing the data in your business then you know that new questions come from across the org on a daily basis. 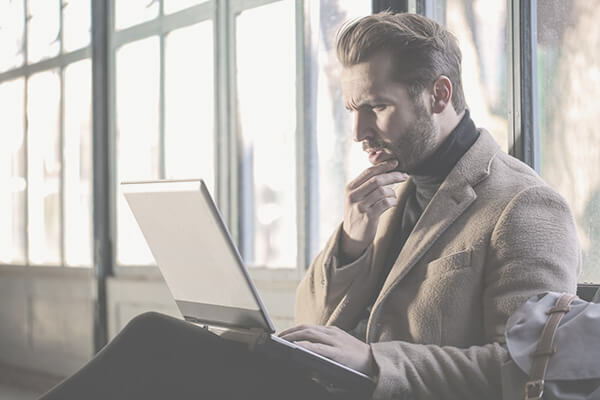 It’s easy to get into a pattern of creating a new report for every question; however, if you’re not careful, you can get bogged down in near-duplicate reports. Unless the parameters for these similar reports are identical, you’ll soon have a mess of conflicting data on your hands. That’s why it’s critical to put a system in place that prevents report duplication and keeps your data clean. Just ask yourself two questions. Before we build any new reports in Salesforce, we start by using a simple question path to determine our next steps. There are two key questions you want to ask yourself before creating a new report. First, ask, Do I have the answer in Salesforce already? It may be that you already have the answer available. If so, it’s your lucky day! Just make sure the parameters are still the same and pull the report. 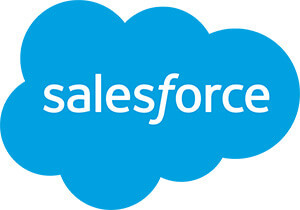 If the answer is no, it’s time to ask the second question: Should it be in Salesforce? Salesforce is an excellent hub for much of your information. But not everything that your business tracks needs to be imported into the platform. So, if you determine that this particular report shouldn’t be housed in Salesforce, your next step is to find out where the answer is—whether that’s your marketing automation platform, customer service software, Google Analytics, etc. If the answer to Question 2 is yes, it’s time to create a new Salesforce report. When you create a new Salesforce report, there are several things you want to consider to ensure that you don’t compromise your data quality. The first is whether or not you’re going to need to answer this question again in the future. If you do, then it’s time to answer how you’re going to track the data: Will you be tracking it in a spreadsheet, a tool’s native reporting, or using a business intelligence (BI) tool like Grow to display the data on a dashboard? Next, what do you need to do to ensure it gets updated on a regular basis? If you’re using a manual solution like a spreadsheet, you’ll need to decide who is responsible to update it, and how frequently it needs to be updated. If you’re going to use a tool’s native reporting, make sure it includes historical data or someone is recording that in a spreadsheet. If you’re using a BI solution, make sure that the metric on your dashboard is set to update at a certain frequency and has the correct parameters. 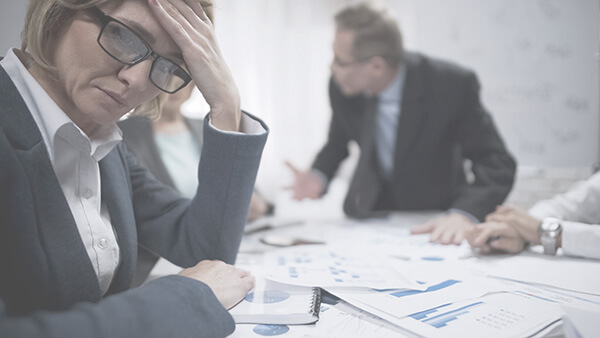 The third concern you have when creating a new report is whether to backfill your data—that is, adding missing past data so your chart is more complete. Backfilling data is only necessary when historical data is important to the current report. For example, if you want to compare this month to the previous month or year-over-year. 1. Mass exports and mass imports. Example: At Grow, our marketing team wanted to set up attribution to see referral sources for new leads, but the information wasn’t in Salesforce. We had to export the referral data from its source (Marketo), and then import it into Salesforce in a mass update. Now referral sources are connected to all our leads. Example: When we realized we needed to start tracking customer use cases, there was no data source we could import from. Instead, we had to individually review each customer’s use case and then manually enter that data into Salesforce. No matter which method you use, an important step in the process is to employ data validation tactics to make sure your data entry stays clean. One of the greatest features of Salesforce is its ability to set up logic to ensure data gets imported correctly. For example, when our sales team marks an opportunity “Closed Lost,” they are required to enter a “Reject/Junk Reason” and a “Secondary Reject/Junk Reason” before they are able to update the Closed Lost status. This ensures that we always know why an opportunity is lost, which allows our sales, marketing, and even product teams to make better decisions for our business. When it’s not possible to set up data validation, another tool you can use is a QA report. This report allows you to set parameters and then receive a notification when those parameters aren’t met. For example, when we add a new customer to our system, there are a large number of fields that need to be filled out. Our QA report flags any record that doesn’t meet the criteria. From there, we’re able to go back and figure out why the error occurred so we can prevent it in the future. The process of building and running this report was time-consuming early on, but nowadays, it is very low maintenance. And whenever an issue does pop up, we get notified promptly so we can fix it. Salesforce is an incredibly powerful tool, but with that power comes the risk of creating a dirty data disaster. 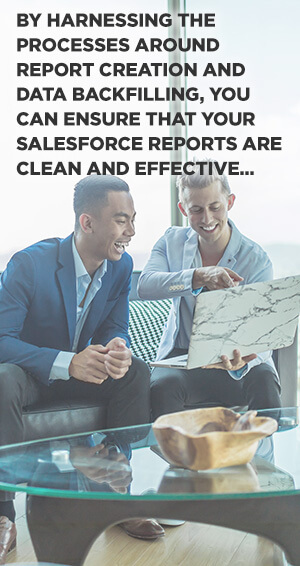 By harnessing the processes around report creation and data backfilling, you can ensure that your Salesforce reports are clean and effective, so you can use them to make the best decisions for your organization.